The Perdana University-Centre for Research Excellence (PU-CRE) was established on the model of 21st century translational science, removing traditional institutional departmental barriers thus creating an effective transdisciplinary research environment. The PU-CRE consists of Translational Research Clusters (PU-TRC) and the Research Management Center (PU-RMC). PU-RMC handles the Perdana University-Institutional Review Board (PU-IRB). 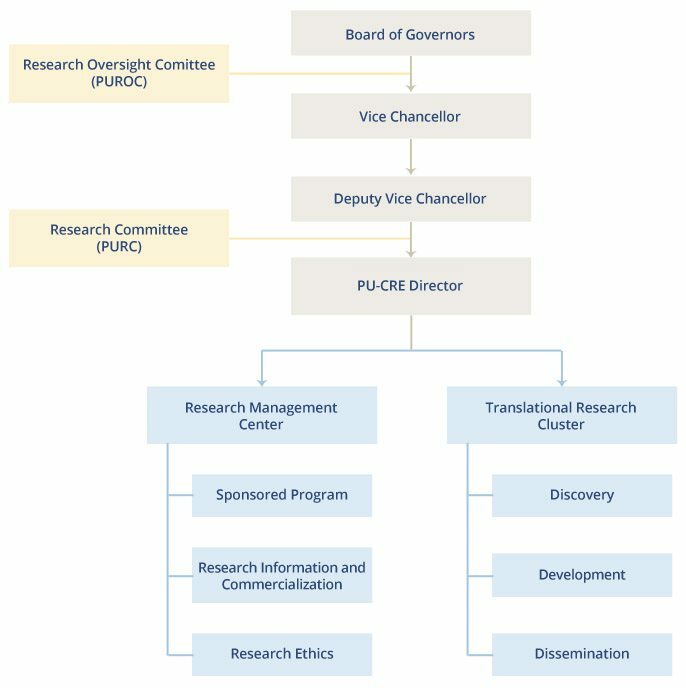 The PU-TRC consists of three clusters; i) Discovery cluster: provides support to projects that are at the innovation stage, ii) Development cluster: provides supports from discovery to proof-of-concept (POC) phase, and iii) Dissemination cluster: provides supports for commercialisation of product leading to application for nationwide use.